This month, ELI Africa has initiated its recycling class, called “Trash To Treasure”, in its two ELI Centers found at Rivière du Rempart and Roche Bois. The initiative behind the inception of this ‘Trash To Treasure’ class is that of Kimtee Ramsagur. “I am always passionate about recycling and I wanted to diffuse my interests in the society, more specifically among the youngest generations. My objective is not only to promote creativity, but is also to make them environment conscious,” says Kimtee. 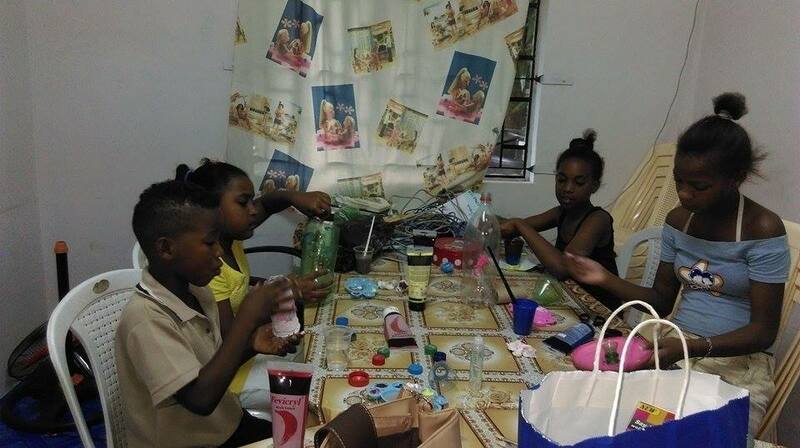 The first recycling class was held at the Rivière du Rempart ELI Center. The students there were zealous about the idea of recycling used products and showed keen interest in the class. “We assisted the students in sorting and assembling their trash to treasure storing boxes. The boys were already planning to create an amazing car through recycling the trash they collected- plastic bottles, soft drink cans, used pens, bottle caps as well as carton rolls from used tissue rolls” add Kimtee Ramsagur and Karishma Rughoonundunn. The students at the Roche Bois ELI Center were not less enthusiastic. They brought every kind of safe trash and creatively used them to come up with new products. From a plastic bottle transformed into a beautiful pot to a beautiful wall décor made from a cover lid, the students creatively used things which would have eventually added up to our saturated dumping sites. At the end of the class, the students were eager to explore their creativity and talent in the next class. “My first class at Roches Bois not only motivated me to go ahead with my project, but also diversified my ideas of how to beautifully convert simple trash to awesome treasures”, concludes Kimtee.